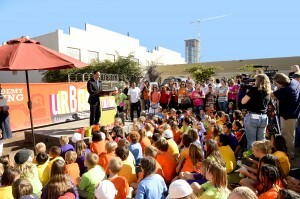 At a groundbreaking ceremony held Oct. 25 for the new Urban Discovery Academy’s campus in the East Village, San Diego City Council President Todd Gloria told a group of students, parents and community leaders that educational opportunities downtown would benefit the entire community. After seven years as a semi-itinerant school, the Urban Discovery Academy will soon put down roots in the East Village. Things are moving quickly for the K-8 public charter school. In September, UDA announced that it successfully sold $10.5 million in municipal bonds for the construction of its new campus at 14th and F streets downtown. On Oct. 25, the school celebrated a groundbreaking ceremony at its future site, and construction began days later. UDA anticipates construction to be completed by July. Move-in will occur in August, in time for students to return in the fall. The campus will comprise two buildings, one of which is an existing two-story, 17,000-square-foot brick structure. The historic building, most recently used as storage for the Community College School District, will be renovated and retrofitted to meet current seismic codes, said Brad Richter, assistant vice president of planning for Civic San Diego, which handles planning and entitlements for the downtown area. In addition, a new two-story, 19,000-square-foot facility will be constructed. The building will include state-of-the-art facilities and a mix of indoor and outdoor spaces. The site will feature a full arts studio, with a photographic darkroom, and ceramics and silk screening equipment, along with a large library space, Levine said. Physical education classes will take place on a planned Rooftop Pavilion, which will also include a garden area, outdoor classroom and middle-school hangout. The school will soon begin a $750,000 capital campaign to raise money to pay for items not covered by the bonds, including $350,000 for the Rooftop Pavilion. The new campus will allow UDA to expand enrollment in the next two years, as the school opens additional 7th and 8th grade classes. Current enrollment is at 390, with Hispanic students making up 31 percent of the population. At capacity, the school will serve 463 students. KCM Group is handling project management, and Davis Reed Construction is building the facility. AVRP Studios is the project architect. During the previous six years, UDA operated out of a rented space on Sixth Avenue, across from Balboa Park. This year the school relocated temporarily to a vacant site on 45th Street and will remain there until the East Village campus is completed. UDA identified the East Village site in 2013 as a location that could deliver on the school’s vision to bring creative elementary education to the city’s urban core. UDA negotiated a 99-year lease on the land, which is owned by the San Diego Community College District. The school’s curriculum uses project-based learning and is grounded in the idea that children learn through real-life interactions and collaborations. At the new site, proximity to downtown destinations will provide students with many opportunities to interact with a vibrant urban community, Levine said. “We envision (the location) giving us the chance to take kids out into the community, to hop on the trolley and go on a field trip, or walk up Park Boulevard and go to the park. It’s a really central location, with ease of getting to public transportation, but also maybe no transportation, just walking to various downtown businesses,” Levine said. The school may also encourage existing downtown families to stay in the area, added Levine. The new campus will be located within a five-block district in the making dubbed Makers Quarter and the broader IDEA (Innovation, Design, Education, Art) District, a proposed 35-block area in the upper East Village. Plans call for the IDEA District to become a cluster for technology and design-oriented companies within the next seven to 15 years. Makers Quarter has already been attracting attention, with a gathering space called SILO and an urban community garden called Smarts Farm. Coming in December will be Quartyard, a 30,000-square-foot temporary park at Market Street and Park Boulevard that will host a coffee shop, food trucks, art galleries, farmers and craft markets, an outdoor beer garden and events. Broadstone Makers Quarter, scheduled for construction in early 2016, will be the first residential mixed-use building in the area. Along with the new Central Library, City College, the NewSchool of Architecture & Design and other downtown establishments, these destinations will provide excellent resources for educational opportunities for Urban Discovery Academy students, said Stacey Pennington, the lead urban planner for Makers Quarter and founder of SLP Urban Planning. The vision for the IDEA District, she said, has always been about bringing innovation, design, education and art elements together in a sustainable way. “For this charter school to be located where it is, it’s going to be more synergistic for this whole area, the energy and dynamic that’s already started,” Pennington said. Klam is a San Diego-based freelance writer.